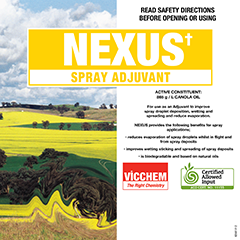 Nexus  Spray Adjuvant is a blend of highly refined Canola oil and non-ionic surfactants that forms a suitable emulsion when mixed in spray water. It can enhance the performance of other agricultural products and is non-phytotoxic when used as directed on product labels. Nexus  is an excellent general purpose adjuvant suitable for use in a broad range of situations as described on the label including; Applications from boom sprays in Broadacre, CDA and ULV sprays, Knapsack and Handgun sprays. 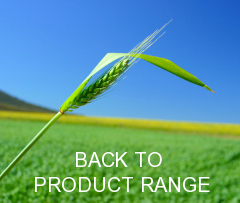 Nexus  can enhance the performance of a wide variety of agricultural products such as herbicides, insecticides and fungicides. The labels of these products must be checked for any adjuvant or compatibility restrictions before use. If unsure of the compatibility or crop safety of a tank mix of Nexus and other agricultural product(s) please mix up a small amount and test by application to a small area before making up spray tank quantities and using it on a full scale basis. The volume of Nexus to be used is dependant upon the spray application method, the crop situation and directions on any companion product. The typical use rate is between 0.1% and 0.5% of the spray tank volume. Always strictly follow all label directions. Maintain good agitation of the tank mix while spraying. To ensure compatibility with other agricultural products and crop safety, mix a small amount and test on a small area prior to making up spray tank quantities. Do not use Nexus with agricultural products that, on their labels, restrict the use of Canola based products in tank mixes. NexusTM is biodegradable, has no withholding period and is based on renewable materials – Canola Oil.